Lauren and I are engaged in a bit of a power struggle lately: the battle of the barrette. 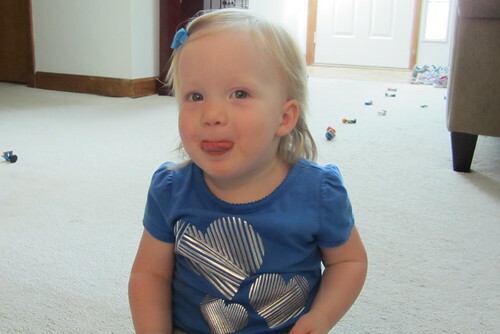 Her hair is getting quite long and hangs in front of her blue-gray eyes. Fortunately, it's wispy fine and see-through blonde so it's not too much of a mess. I try to explain to her that she might actually like having her hair out of her face and wouldn't it be pretty if her barrette had a bow that matched her outfit? 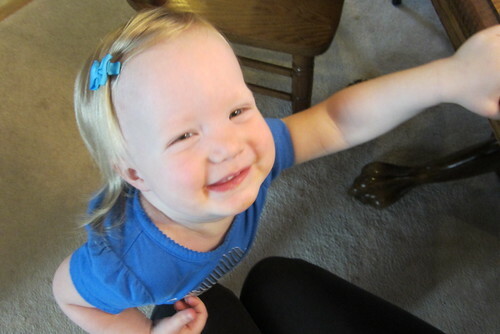 On this particular day, she humored me and wore this little blue bow for several hours. Oddly, she even insisted on wearing it during her nap. 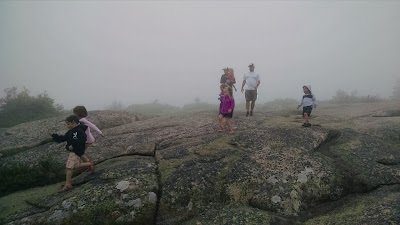 But most of the time, she's still pretty adamant that she doesn't want anything in her hair and will throw hair bows and hair elastics an impressive distance from her. My girl definitely knows what she wants. This has placed her right in the middle of sibling squabbles. Even she and Tobin argue over toys these days. His meticulously ordered car-race tournaments--replete with seeding of the competitors--don't mix well with her sudden and strong interest in one particular purple car. She's definitely the youngest of the kids to use phrases like "Mine!" and "My turn!" As sharing is especially hard for her, we're trying to get the boys to help her learn by getting them to ask for something instead of trying to grab it back from her. Sometimes she'll surprise us by returning something with a concilatory "Okay." Understandably, Lauren is very intent on keeping up with her brothers. 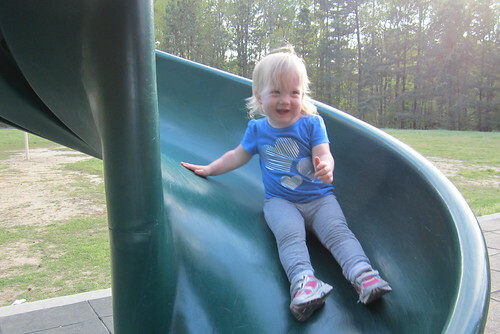 She will slide down any slide on any playground. She's fearless. She reminds me of Evan with her enthusiasm. When coming down a slide she'll yell something like "Okay! Watch! Woo hoo!" 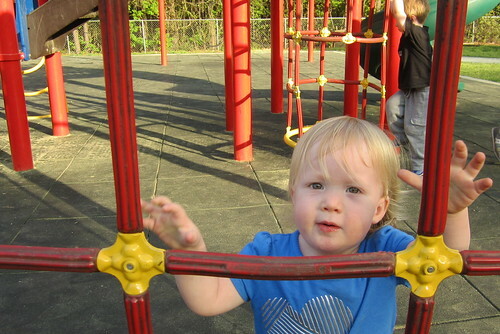 She'll spend much of the time at a playground squealing as she runs from one thing to the next. And "woo hoo!" is like a catch-phrase for her. 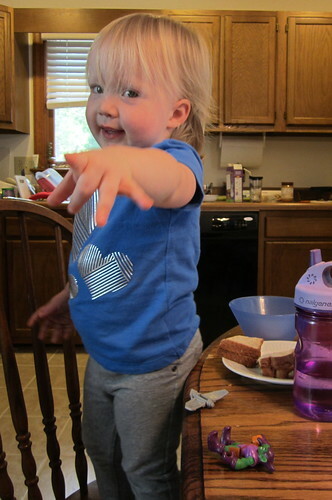 She uses it frequently--when finishing a meal, when catching a ball, when climbing into her car seat on her own--and often solicits an accompanying high-five. Lauren is talking up a storm. She particularly loves numbers and now counts rather effortlessly to ten and adorably ventures into the teens. I love singing to her before I put her in her bed. She snuggles up and sings her ABC's and "Twinkle Twinkle Little Star" with me, usually with her thumb in half-way in her mouth. It's a nice pre-sleep bonding time for us, replacing our nursing routine that we had to end so abruptly about two months ago. Around that time, I was really the only one who could put her to sleep. Now she's fairly easy for anyone--Matt, Mimi, Grandma--to put down for a nap or bedtime if they follow her reading and singing routine. I'm very proud of her for making this transition. It's so helpful for all of us and I'm thankful that others get to share this especially sweet time with her. As the weather has warmed we're going on more frequent and longer walks. Walking is especially good for me as it helps counteract my fatigue. 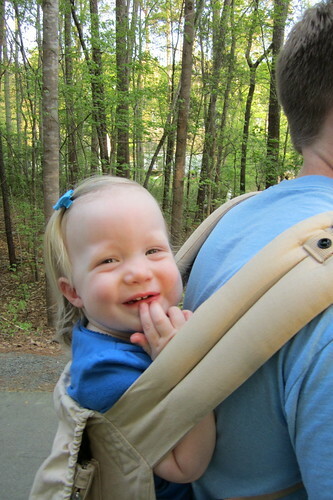 The boys prefer to ride their bikes and Lauren likes to stop and pick up rocks and sticks and "pretty flowers!" This made walks a difficult "shared" activity as one of us walked quickly to keep tabs on the boys while the other hung back with Lauren to try to coax her to pick up the pace, or at least walk in the same direction as everyone else. She's not a big fan of the stroller these days--plus it's kind of annoying to add to the mix as one of us usually ends up carrying Evan's little bike when we cross the street or encounter big hills--so Matt started carrying Lauren on his back in the Ergo. While she doesn't love it all the time, she rides happily enough, especially if Matt plies her with granola bars and apples along the way. And at some point, we always let her get down so she can run and squeal or collect treasures. In this sense, she's learning to compromise, which means gives me hope for barrettes or ponytails--and everything. I looooooove this post! How delightful that she is talking up a storm. She is adorable. Hope you are doing well. Praying for the medical team, you and family. One of the absolute joys in my life is when I visit my granddaughter and her parents, I often get to put her to bed. I treasure those times and appreciate the gift.